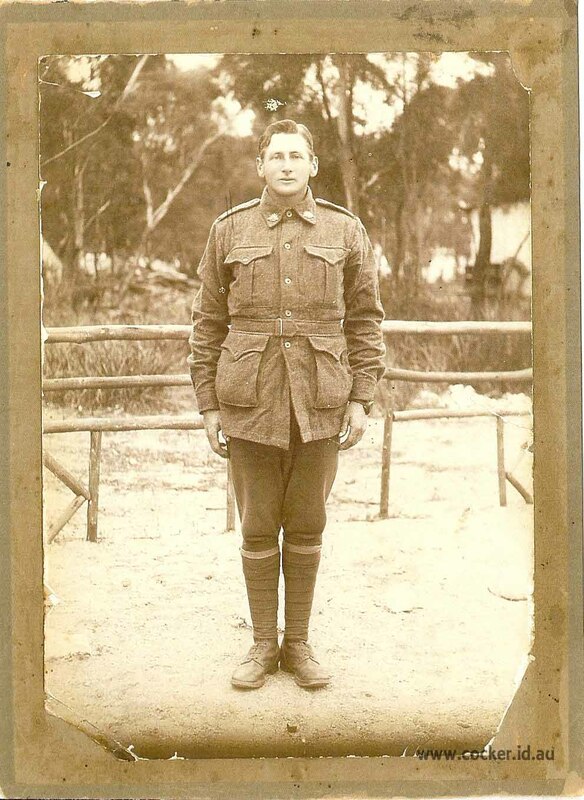 When William Percival Dudley enlisted in the AIF in 1916 he stated he was a butcher in Winnaleah and that he had been adopted by Joseph and Emma Cocker. There is no record of his birth. 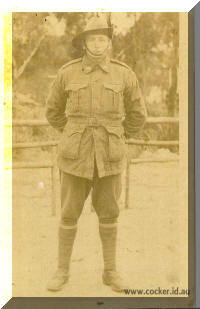 He was formally discharged from the AIF due to rheumatism in his knee which rendered him unfit to drill on 15 Mar 1917. 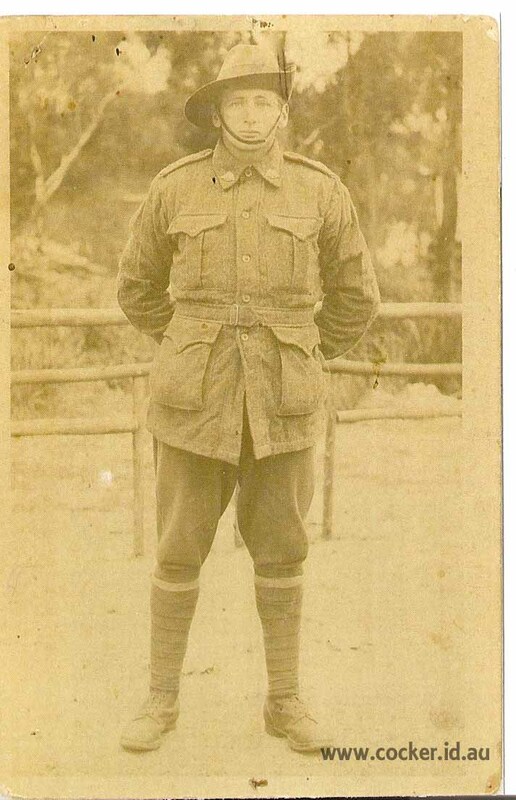 He married Florence Maud McGuire at Moorina on 17 Feb 1917 and they had two children, Lawrence Percival at Winnaleah on 14 October 1917 and Amy Isabell at Winnaleah on 24 Dec December 1918 in Winnaleah. 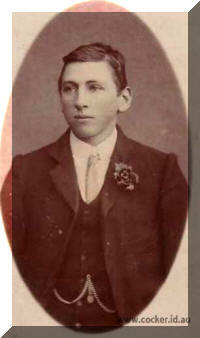 In September 1921 he, labourer, and Thomas Jacobs, builder, of Ulverstone filed for bankruptcy. From that point he seems to have vanished. Percy Douglas Cocker and Florence Maud McGuire raised Lawrence and Amy (above) and seven more children between 1920-1933 as their own but none of the births appear to have been registered. There is no marriage record for Percy Cocker and Florence McGuire. On 13 Jan 1927 at a creditors meeting Percy Douglas Cocker, a labourer of Ringarooma, disclosed that his liabilities were £308, and that he had no assets. He admitted that he was identical with William Percy Dudley, a labourer, of Moorina, who filed his petition in 1921. Thus it seems Percy enlisted in an assumed name (perhaps he knew his enlistment would be refused on health grounds if he used his correct name) and he married Florence McGuire in that name before resuming his correct name some time after he was declared bankrupt in 1921 and 1927. Florence is pictured here aged about 84. 4-Laurence Percival Cocker was born about 1918, died in a motorcycle accident on 13 Sep 1946 at the corner of Abbot and Wentworth Streets, Launceston aged about 28, and was buried on 16 Sep 1946 in Carr Villa Cemetery, Launceston. 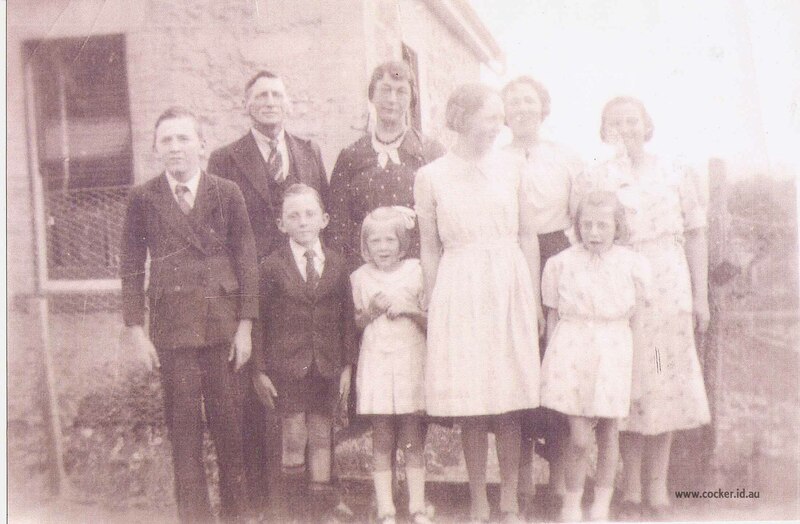 Laurence married Betty Dawn Breward on 28 Feb 1945 in St John's Church of England, Launceston. 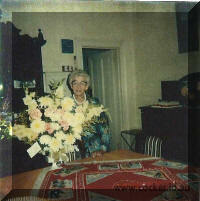 Betty was born about 1929 and died on 4 Jun 1981 in the Launceston General Hospital aged about 52. COCKER.-In fond and loving memory of our dear son and brother, Laurence Percival (Laurie), who died result of accident, September 13, 1946. Our hearts still ache with sadness, Our eyes shed many a tear, God knows how much we miss you, As it dawns the second sad year. What would we give to clasp your hand, Our loving son to see, just to hear your dear sweet voice, Which meant so much to us. Dearly loved and sadly missed. -inserted by his sorrowing mum and dad, sisters and brothers, brothers-in-law, St. Leonards, Launceston. Deloraine and Evandale. COCKER.--In loving memory of our dear brother, Laurence Percival, who was accidentally killed September 13, 1946. Far away there's a beautiful valley, Where lingers no shadow or pain, Where sojourns for ever will be happy, Where loved ones will meet once again Do you ask the name of that valley," Oh, heart, with wild grief often pressed 'Tis the land of God love and fair beauty, The beautiful valley of rest. --Inserted by his loving sister, Maris, brother-in-law, Bill, nephew and nieces. They had four children: Robin, Marlene Emillia, Roma June and Lawrence Douglas. 5-Marlene Emillia Cocker was born on 22 Sep 1944 in Launceston, Tasmania. Marlene married Michael McCulloch. They had a daughter: Olivia. 5-Roma June Cocker was born on 22 Mar 1946 in Launceston, Tasmania. Roma married Geoffrey College East. They had three children: Stephen Michael, Angela Megan and Narelle Dawn. 6-Stephen Michael East was born on 23 Oct 1966 in Queen Victoria Maternity Hospital, Launceston. 6-Angela Megan East was born in 1973. 6-Narelle Dawn East was born in 1974. 5-Lawrence Douglas Cocker was born on 24 Mar 1947 in Beaconsfield, Tasmania. 4-Amy Isobel Cocker was born on 24 Dec 1918 and died on 16 Aug 2015 in Deloraine, Tasmania at age 96. Amy married Clifford William Sheriff, son of H. Sheriff. They had three children: Valerie, Pauline and Heather Rosemary. 5-Heather Rosemary Sheriff was born on 19 Jun 1947 in Queen Victoria Maternity Hospital, Launceston. 4-Florence Maud Cocker was born on 26 Oct 1920. 4-Mavis Mary Cocker was born on 10 Dec 1921 and died on 15 Mar 2008 at age 86. Mavis married William C. Houston. They had four children: Patricia, Kimberley, Marie and Janice Mary. 5-Janice Mary Houston was born on 29 Jan 1946. Mavis next married Max Watson. 4-Maisie Agnes Grace Cocker was born on 28 Apr 1924 and died on 8 Mar 2011 in Launceston General Hospital, Launceston at age 86. Maisie had a relationship with Eric Campbell. They had one son: Neville Royce. 5-Neville Royce Cocker. Another name for Neville is Johnny. Neville married Carol. They had a daughter: Amber. Maisie next married Norman Rawnsley, son of Len Rawnsley and Isabel. They had two children: Charles and Stephen. 5-Charles Rawnsley. Charles married Dee. 5-Stephen Rawnsley. Stephen married Estela. Much loved wife of Norman (dec.). Loving mother of Johnny, Charles and Stephen and mother in law of Carol, Dee, and Estela. Cherished grandmother of Craig (dec.), Tyger and Rocco, and great grandmother of Amber. Loved daughter of Percy and Florence Cocker (both dec.), and sister of Laurence, Mavis, Stan, Max, Valma (all dec.), Amy and Beverley. 4-Stan Cocker was born on 28 Apr 1924. Stan married Rhona Rice. They had five children: Louis, Dorothy, Margaret, Marion and Gilbert. 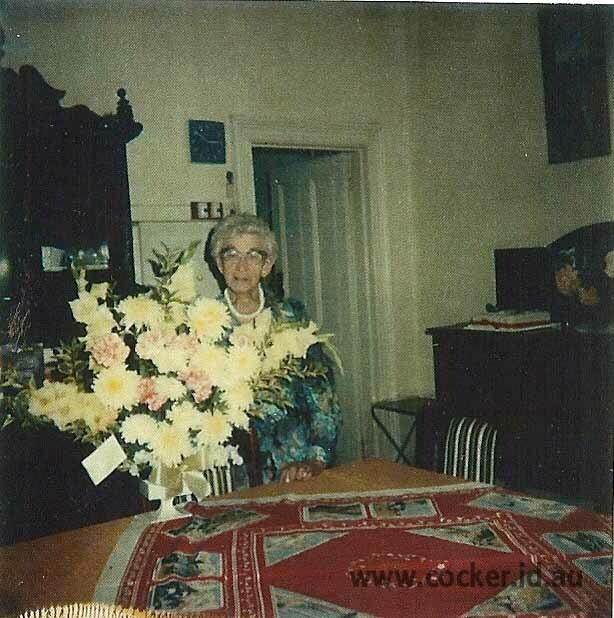 4-Valma Joyce Cocker was born on 10 May 1931 and died on 11 Sep 2006 at age 75. Valma married Reginald Christopher Cabalzar, son of Christopher Cabalzar and Margaret Evelyn Freeman, on 9 May 1953 in Congregational Frederick Street, Launceston, Tasmania. 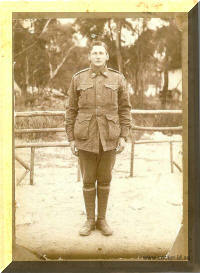 Reginald was born on 10 May 1915 in East Devonport, Tasmania and died on 11 Dec 2004 at age 89. They had five children: Christopher Reginald, Julie Roseanne, Joy Merrlyn, Wendy Regina and Kerrie Lea. 5-Christopher Reginald Cabalzar was born on 28 Aug 1953 and died on 21 Feb 1971 in Carr Villa, Launceston D16/145 at age 17. 5-Julie Roseanne Cabalzar was born on 2 Nov 1955. 5-Joy Merrlyn Cabalzar was born on 5 Jun 1959. Joy married Neil Dickson. They had two children: Anita and Corey. 6-Anita Dickson was born on 27 Oct 1977. Anita had two children: Xavier and Caleb. 7-Xavier Dickson was born in Mar 1996. 7-Caleb Dickson was born on 29 Dec 1999. 6-Corey Dickson was born on 23 Mar 1981. Joy married Kevin Brooks. They had two children: Sally and Jackie. 6-Sally Brooks was born on 24 May 1984 and died on 1 Dec 1996 at age 12. 6-Jackie Brooks was born on 2 Nov 1986. 5-Wendy Regina Cabalzar was born on 5 Jun 1959. Wendy had a relationship with Ray Russell. They had three children: Linda Jane, Donna Maree and Christopher Ray. 6-Linda Jane Cabalzar was born on 5 Oct 1987. Linda married Daniel Obadiah Vandenberg. They had two children: Caitlin Laurel and Jenoah Daniel. 7-Caitlin Laurel Vandenberg was born on 6 Oct 2006. 7-Jenoah Daniel Vandenberg was born on 3 Jun 2008. 6-Donna Maree Cabalzar was born on 11 Jan 1992. 6-Christopher Ray Cabalzar was born on 1 Jul 1994. Wendy next married Phillip Wise. 6- Jarrod Paul was born on 7 Mar 1993. 4-Maxwell Douglas Cocker was born on 10 May 1931 and died on 15 Mar 2008 in Scottsdale, Tasmania at age 76. Maxwell married Beryl Olive Davis, daughter of John Eric Davis and Lillian Olive Pearn, on 30 Mar 1957 in St Johns Church of England, Launceston. Beryl was born on 30 May 1934 and died on 9 Mar 1997 in Launceston General Hospital, Launceston at age 62. They had three children: Lynette Lillian, Christopher and Phillip John. 5-Lynette Lillian Cocker was born on 20 Feb 1958. 5-Phillip John Cocker was born in 1960 and died on 5 Jan 2015 in Launceston East, Bass, Tasmania, Australia at age 55. Maxwell next married Elaine Clayton. They had two children: Tracey and Grant. Maxwell next married Lindy Joy Triffet. They had eight children: Rebecca Joy, Melanie Rose, Daniel Leon, Joshua George, Naomi Evelyn, Brook Estelle, Amelia Florence and Madeline Alexandra. 5-Rebecca Joy Cocker was born in 1983. 5-Melanie Rose Cocker was born in 1984. 5-Daniel Leon Cocker was born in 1986. 5-Joshua George Cocker was born in 1988. 5-Naomi Evelyn Cocker was born in 1992. Naomi married Aaron. They had one daughter: Ella Joy. 6-Ella Joy Cocker was born on 12 Jul 2009 in Queen Victoria Maternity Hospital, Launceston. 5-Brook Estelel Cocker was born in 1993. 5-Amelia Florence Cocker was born in 1994. 5-Madeline Alexandra Cocker was born on 10 May 1996. 4-Beverley Dawn Cocker was born on 16 May 1933. Beverley married Terence Chilcott, son of Roy Stanley Chilcott and Enid Evenett, in 1955 in St Leonards, Launceston. Terence was born in 1929 and died on 15 Oct 2016 in Presbyterian Care, Norwood, Launceston at age 87. Chilcott Terrence Passed away peacefully October 15th, 2016 at Presbyterian Care, Norwood aged 87. Much loved and respected father of Jenny and Peter, father-in-law of Ronda and Teresa. Devoted and loving grandfather of Kate, Brendan, Jake and Kelly and great grandfather of Jordan. They had two children: Jennifer and Peter. Beverley next married Joseph Robert Skeggs, son of Raymond Carl Skeggs and Hazel Jean McGilp, on 15 Oct 2005 in Salvation Army Citadel, Launceston. Joseph was born in 1932 in Scottsdale.